While I’m working on a review of Honey Badger – Slayer of Memes, here’s something short that I wrote and posted on 1000Fraggers a few months back. RPGs are made by their music. This started germinating in my mind while I was thinking about Secret of Mana earlier today. I first played Secret of Mana about fifteen years ago, maybe a little longer. To this day I find its music evocative of the feeling of experiencing the game. ‘Into the Thick of It’ conjures mingled sadness and optimism, thanks to its excellent composition and cunning placement just as you’re kicked out of your home village. ‘Mystic Invasion’ brings back the quiet menace of entering an unfamiliar underground temple and not really knowing what to expect inside. 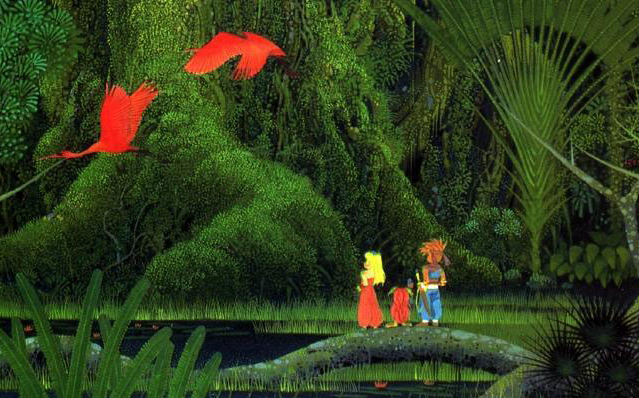 The music has kept Secret of Mana alive for me. Similarly, Morrowind, though its repertoire is far more limited, inspired me to listen to its soundtrack. I can’t hear ‘The Road Most Travelled’ without immediately being transported back to the Bitter Coast or Sadrith Mora. I can’t help feeling that many recent games are lazy with their music. It’s easy to sound grand or menacing when you have an orchestra at your disposal. You could play any old sequence of notes and have a fair chance of producing something vaguely soundtrack-worthy. In the 16-bit and 8-bit console days, soundtrack composition was, of necessity, more inventive. Think of how many of the most distinctive and memorable game themes (and not only from RPGs) were originally written for those old consoles: the Mario theme, the Sonic theme, the Final Fantasy victory fanfare, the Zelda theme (and early PC games too, though I’m not so familiar with them. Doom comes to mind). With a full orchestra, would such memorable pieces of gaming music have been written? Call me a pessimist but I don’t think so. With limited resources, it was the writing that made music atmospheric or evocative. Now that necessity is gone, and some of the musical creativity with it. So please, game music composers, try writing soundtracks as though for a Super Nintendo. Your work will be better for it. You can always add your pet orchestra later.